This is where it all began, just a mile beyond the Green Monster, where Theo Epstein fell in love with baseball as a kid, and forever changed the fate of two iconic franchises. And this is where it continues, with his twin brother, Paul Epstein, still living in their hometown of Brookline, improving lives around him as one of Boston’s finest humanitarians. Born 60 seconds apart, these two brothers, who chose to utilize their ultra-competitiveness in different facets in life, will be together again this weekend. They’ll be watching Theo’s Chicago Cubs visit Fenway Park for the first time as defending World Series champions, and then getting together trying to raise nearly $1 million for charities. The weekend is being billed as a potential 2017 World Series preview, with box seats going for as much as $800 for the three-game series beginning Friday. The Cubs’ 2016 World Series trophy and Red Sox’s 2004 World Series trophy will be on display Saturday evening at their Hot Stove Cool Music charity concert. And the Sunday night game will be nationally televised by ESPN. Yet, throughout the weekend, a figure who won’t don a uniform will be the center of attention. The only executive to build World Series championships in Boston and Chicago, ending combined droughts of 194 years. The man who anointed the world’s greatest leader by Fortune magazine, yes, two spots ahead of Pope Francis. That’s not an uncommon occurrence. As perhaps the most respected franchise builder in sports, Epstein’s capital in baseball is significant – and makes others ponder how he could spend that in other arenas. Epstein, predicts David Axelrod, chief strategist for former president Barack Obama and a senior political commentator for CNN, could find similar success in a far more significant arena. Really, Epstein reminds him of Obama with his brilliance, charisma, and oratory skills. “He has the gifts to be successful in politics,’’ Axelrod tells USA TODAY Sports, “but I don’t know if he has the stomach for it. He performs so well in the public spotlight, speaks impeccably and beautifully in a very literary and sensitive way. But he’s really an introvert. He clearly likes his privacy and to be with his family, but in politics, you have to sacrifice so much of that. The man who knows him best, and his closest friend in life, believes that if Epstein ever leaves his current job when his contract expires in five years, he still would remain in baseball, perhaps in the influential ownership circle. It’s this fascination and allure with Epstein that will have a horde of reporters and camera crews following him the moment he walks into Fenway Park on Friday. It will be his first time at Fenway Park, outside visiting friends in the baseball operations department, since leaving as the Red Sox GM after the 2011 season. The Cubs were here in 2014 for only the second time since 1918, but he missed the trip to be with his wife, Marie, due with their second son. He’ll begrudgingly do a news conference Friday, answer all of the questions, but believes in his heart of hearts, that the wrong man will be in front of the cameras. It’s his brother, Paul, who along with his parents, has influenced him more than anyone in life. Paul Epstein is a social worker and guidance counselor. He also happens to be an exceptional athlete, who played soccer and competed in the decathlon in college, and just completed his 10th Boston Marathon, raising about $10,000. 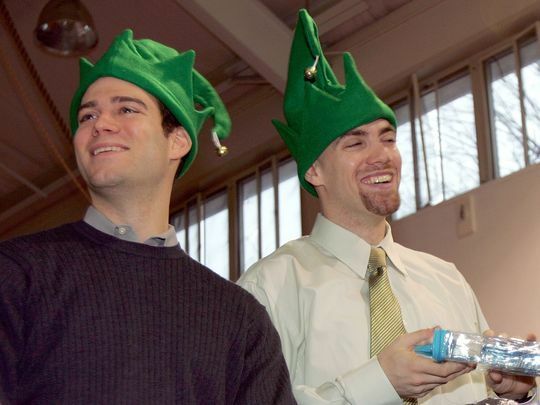 While Theo is regularly seen in the Cubs’ clubhouse or on the field, Paul he can be found in Room 174 at Brookline High School, where the two of them graduated in 1991. Theo went on to Yale, interned with the Baltimore Orioles, cut his teeth with the San Diego Padres and, by 29, had won the first of two World Series titles with the Red Sox. He was still just 42 when the Cubs club he constructed won it all. Paul, who fell in love with social work when he joined Big Brothers as a college sophomore, went to Wesleyan University in Middletown, Conn., but came right back home. If he’s not working as a high school counselor during the days, or spending evenings with abused and neglected youth, he’s dropping into the teen recreation he spent eight years helping build. And, yes, sometimes with Theo’s furniture. “He would come over to visit my place,’’ Epstein said, “and I’d assume it was just to hang out. But, after he left, I noticed he took a coffee table, all my dishes, a television, anything he could fit in his car, and would be on his way to deliver them to the family. The man he idolizes, worships, and absolutely adores. And it’s Paul who seems to most easily cut through Epstein’s baseball savant exterior. Says Epstein: “In the late 90’s when I was working for the Padres and Paul was working at a home for kids who had been abused, we would talk every night about our jobs. Hearing the work that he was doing was really humbling, and a stark reminder that baseball is really just part of the bread and circus of our society, a pastime to keep people entertained. A mutual desire for impact inspired the twins to form a charitable foundation in the wake of the Red Sox’s 2004 title. In the years since, The Foundation To be Named Later has raised about $9 million in 11 years to youth organizations, helped fund 65 scholarships to baseball Hall of Fame writer Peter Gammon’s college program, and are expected to raise $750,000 alone this weekend in their concert highlighted by Pearl Jam frontman Eddie Vedder. And as different as their personalities may appear to outsiders – with Paul the extrovert and Theo the introvert – they’re actually quite similar. The sharp mind, cutting wit and quietly fierce competitive nature – on display in basement boxing bouts growing up – define both. It’s just that Theo loves the action too much to ever do what Paul does on an everyday basis. And Paul simply has never had the desire to do what Theo does. That’s OK; the more succcess Theo finds in baseball, the more lasting the impact on Paul’s work. “It’s such a great dynamic,’’ says Cubs assistant GM Jed Hoyer, who went to college with Paul. “Theo really admires what he’s done professionally, and how committed he is to helping kids. He wants to use his position to not only help kids, but help Paul, and you see how committed he is to it. You want success? The Epsteins’ grandfather, Philip, wrote the screenplay of Casablanca with his twin brother, Julius. Their dad, Leslie, is a Rhodes scholar, Boston University English professor and author. Their sister, Anya, is a television writer and producer whose projects have included: “Homicide: Life on the Street.’’ And their mom, Ilene, runs a high-end boutique in Brookline with her identical twin, Sandy, that raises money for charities. And you wonder why Theo hardly is content in life for something trivial as being the architect of a few World Series championship teams, no matter how revered he is in the sports world? “This is a guy who is intensely interested in winning as many titles as possible,’’ Axelrod says, “but not to the exclusion or to the awareness of the outside world, which touches him. He has great passion for baseball, I’m not minimizing that. He understands there are people out there getting paid ridiculous amounts of money, and those who hardly get paid and are impacting people’s lives in a very important way. Epstein accompanied Chicago Mayor Rahm Emmanuel three months ago to the South Side of Chicago at a “Becoming a Man’’ mentoring session, a counseling program for students. Epstein was visibly moved by the experience, called Paul immediately, telling him that he discovered another program to include among their charities. ”’Paul has that seen that firsthand, in Theo’s “other” city. The feeling is mutual, but no matter how much Theo loves his brother, and as much money as he badly wants to raise for their foundation, sorry, he told Paul that he just can’t adhere to his request. 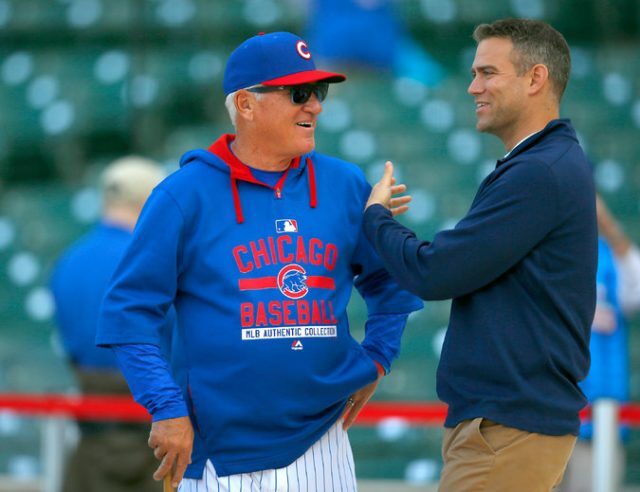 “We were talking about how much money Theo could raise by auctioning off his Cubs’ World Series ring,’’ Paul says, laughing. “Come on, can you imagine what we could get? He’s not budging.